Rachael Ray and her show 30-Minute Meals was my jumping-off point to learning how to cook: she just made it look so easy, especially for someone like me who would proudly make herself mac-n’-cheese out of a box, throw in some microwaved spinach, and call it a well-rounded meal (can you blame me? Carbs, protein and a vegetable, right? Wasn’t that supposed to be wholesome?). My dad tried to teach me how to cook when I was in high school, but that didn’t go so well, because a) I had a bit of a “Why are you teaching ME to cook and not my brother, huh? Is it because I’m a GIRL?” attitude we couldn’t quite move past, and b) my father and I didn’t exactly jive in teacher-student situations, partly because he really enjoyed giving direction and partly because I kind of despised being the one directed. I was a fun teenager. Once I got to college, I didn’t have to learn how to cook, because college came with such things as a cafeteria, Amore Pizza and ramen noodles. I was set. I wanted to learn how to cook, though, as I moved into my 20s, and eventually into an apartment without roommates or a bug infestation (looking at you, Philly suburbs, circa 1998-2000) and Rachael Ray seemed to know that, like she was a telepathic genius wielding a chef’s knife. Once David and I settled into our life together, cooking became something fun, standing in the bright kitchen of our first house talking and playing music, without a worry at all except making sure I didn’t set the oven on fire again. But we’re in a different stage of life now. Sometimes, yes, there are the evenings I pour a glass of wine and put on some music and enjoy the actual dinner-making process again (though my company now is a bunch of kids doing homework at the kitchen table.). Other nights, our dinner arrives courtesy of Chipotle take-out. But I’m trying to get better about making sure we eat more at home. It’s a bit of a struggle: for one thing, the kids will say that all the “healthy food” has ruined my tastebuds because McDonald’s would make for a perfectly delicious dinner, too. And I’ve abandoned a lot of my old–preferred–vegetarian ways out of pure frustration at trying to accommodate the four meat-and-potatoes lovers with whom I live. So some days it’s not fun. But a recipe like this one comes to the rescue: because it’s easy. And it’s basically wholesome. And because–sorry, kids–it most definitely did not come from McDonald’s. This is one of the first recipes I tried of Rachael Ray’s, mainly because it was–like now–the middle of January and I needed a ray of sunshine in food form–and it’s been a staple since. The jerk fish takes no time at all to cook, and it basically just involves a sprinkling of salt and jerk seasoning and throwing it in a pan (no: don’t throw it in the pan. I know from personal experience that this will cause a fire that will melt the microwave that hangs above your stove). I’ve tried different pieces of white fish with this, and while the more expensive halibut tastes the best, a more wallet-friendly cod will work, too. The coconut rice provides the perfect tropical-vibe accompaniment, and the pineapple will keep the kids happy, so long as you leave some raw pieces to the side because your children get super picky when it looks “burnt” ( and yelling “IT’S JUST SEASONED EAT THE PINEAPPLE!” doesn’t usually help matters). I usually steam some broccoli or snap peas to go along with it, because David and the kids pick the peas out of the rice and now you see what I have to deal with. (Also: if you have young children and decide to make this for dinner one night you will, at least three times that evening, remind them that you are not CALLING ANYBODY A JERK FOR CRYING OUT LOUD IT’S WHAT THE SEASONING IS CALLED. See? Cooking is a breeze). Bring the rice, coconut milk, butter and 1 cup cold water to boil in a small, heavy saucepan. Cover, lower the heat and simmer about 15 minutes. Take the cooked rice off the heat and fluff with a fork. Stir in the thawed peas and cover again to keep warm. While the rice simmers, heat a large, heavy skillet over medium-high heat. Season the fish on both sides with salt and the jerk seasoning. Add the olive oil to the pan, making sure the entire surface is coated, and add the fish. Cook until golden, about 3-5 minutes on both sides. Remove the fish from the pan, then add the pineapple, cooking about 2-3 minutes on both sides until softened and browned. Chop 2 pineapple rings into small cubes and stir into the rice along with the peas. Season with salt and pepper. 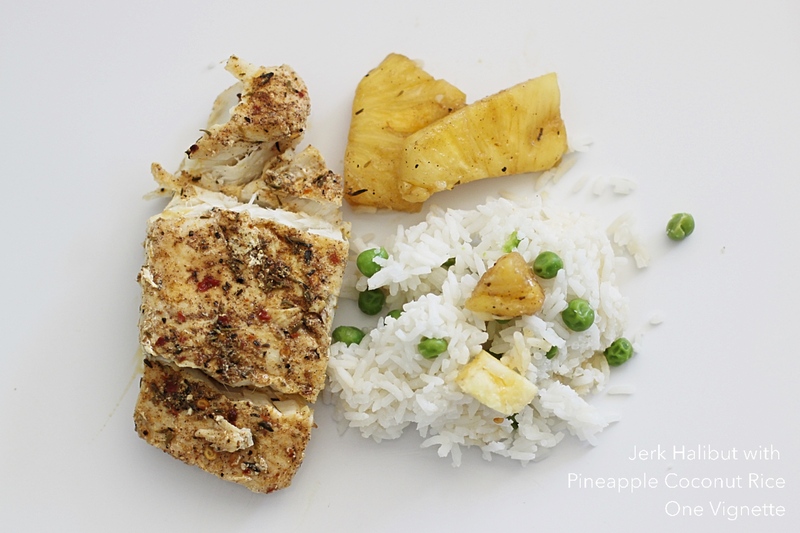 Arrange a pineapple slice, a fish fillet and rice on each plate. (Ignore the children who ask if they really have to eat the peas.) Garnish with lime wedges.